IN AND OUT: Cats midfielder Scott Selwood. With nine rounds left in the home and away season, Geelong faces three sides that sit above it on the ladder in the run to the finals. Sydney, Richmond and Melbourne present stern challenges for the Cats and with 15 wins looking likely to secure a top four spot, a win, or two, against these sides is imperative. The Cats faces the Western Bulldogs tonight at Etihad Stadium in what should be a win, although they won’t want to take the Dogs lightly. The Bulldogs almost snatched a win against a finals-bound North Melbourne last week. Geelong is fresh from a bye and simply must win tonight. Coming up after the Doggies game, are consecutive interstate trips. The Cats will meet Sydney at the SCG next weekend and will then make the short hop over to Adelaide for the Crows the following week. Geelong has been able to get games into a host of youngsters while still remaining a contender this season. Tim Kelly (13 games), Jack Henry (12), Lachie Fogarty (10), Jordan Cunico (10), Brandan Parfitt (nine) and Esava Ratugolea (eight before injury) have all shown enough to suggest they will be long-term contributors. Geelong will unveil another debutante tonight, Quinton Narkle. The 20-year-old Western Australian will be the sixth Cat to done the hoops for the first time this season. “It took a few games to find my bearings again but after I took a few knocks and started kicking a few goals I started to get that confidence back,” Narkle said on Wednesday. “He’s a really contested player, sharp with the ball (and) can play multiple roles,” coach Chris Scott said. The Cats have a host of stars nearing a return to the senior side. 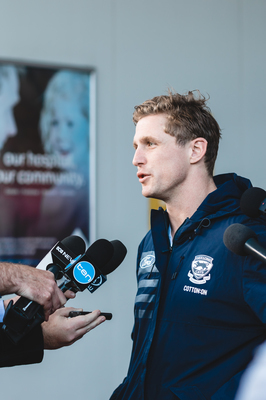 Scott Selwood, Dan Menzel, Harry Taylor and Cam Guthrie all look to be on the mend following injuries. Patrick Dangerfield has dined out against the Western Bulldogs the last two times he has played against them. The midfield star has racked up 74 possessions and six goals against the Dogs. It will be interesting to how the Bulldogs respond after last week’s heartbreaking loss. They could be broken or they could come out determined to make amends. “We fell apart structurally in the last two minutes after we kicked our last goal of the game,“ coach Luke Beveridge said. Geelong has won the past 11 games between the two sides. With three away games in as many weeks, this looms as a danger game for the Cats. But if the side is serious about September, they need to put away the teams that sit well below them on the ladder. It could be an arm wrestle for a while, but Geelong should prevail by around four goals.